Swarovski Cinderella Slipper – 2015 Limited Edition of 400 Shoe Figurines! On March 13, 2015 Disney released a new Cinderella movie, and no doubt, Swarovski played an important role keeping the sparkle alive. Outside of the movie, the crystal giant has created a replica Swarovski slipper. This Limited Edition Swarovski Slipper is 85% of the size of the movie slipper. This 2015 Limited Edition slipper is recognized by Swarovski using the following identification numbers: 9100 000 622 and 5179692. 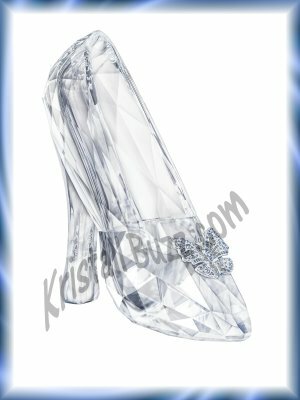 The Swarovski Limited Edition Slipper is approximately 6 1/2″ X 2 1/2″ X 6 1/4″. It features 220+ facets in clear crystal. It is decorated with a (silver) rhodium-plated butterfly, set with light blue crystals. It is available as a numbered limited edition of only 400 pieces. Each slipper is uniquely numbered on the underside of the slipper and includes a certificate of authenticity. One website showed a selling price over $2100, but I did not find the Swarovski Slipper on the official Swarovski web site to confirm the actual retail price. This Limited Edition Swarovski Cinderella Slipper should not be confused with another Limited Edition Swarovski Cinderella’s Slipper. This Cinderella slipper has an identification number of 5035515 and is significantly smaller and less expensive. While it may be sold out on the Swarovski website, it can be easily found on the internet for original MSRP of $100. Disney also produced their rendition of a Limited Edition Cinderella Slipper. The Disney Slipper is a Limited Edition of 500 units. The Disney Slipper features golden butterfly encrusted with Swarovski crystals. It too is individually numbered on the bottom side of the slipper and includes a Certificate of Authenticity as well. This figurine is successfully selling at the online auctions at $550 – $1150! In the early 2000’s, in the Silver Crystal product line, there was a Swarovski Cinderella figurine, complete with a mini crystal slipper. 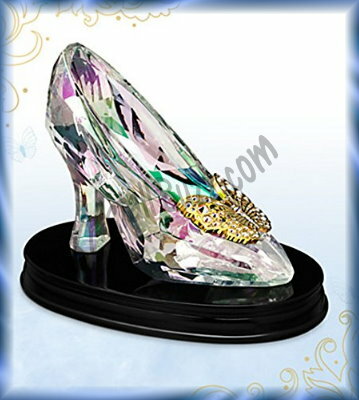 When collectors purchase this figurine from any source, make certain that the slipper is still with the Cinderella figurine as it can be very difficult to locate a replacement Swarovski Slipper to go with it. For 2015, there is another Limited Edition Swarovski Cinderella, that retails for nearly $600. There are certainly a variety of Cinderellas available, as well as Limited Edition Cinderella Slippers available that are either Swarovski figurines or Disney figurines embellished with Swarovski crystals. So if you are a Cinderella fanatic, you won’t want to miss out looking for one of these to add to your collection! Today is the Pi Day of the century, the ultimate for math fanatics! Pi, known by mathematicians as π, is an irrational number that begins with to 3.1415926535… Today is 3.14.15 (we have the first five digits so far!). At 9:26:53 am or pm, that’s the next five digits. So, at 2 different times day, we have the first 10 digits of π! The next time that will happen will be in 2115, and just how many crystal fanatics might be around for that celebration! 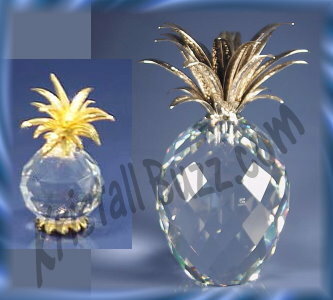 Swarovski Trimlite Pineapple (left) and Swarovski Silver Crystal Pineapple (right). Small Pineapple – 52622. Production dates for this Trimlite Pineapple was 1985 to 1988. It measures about 2″ tall, including the crystal and gold metal topper. Medium Pineapple – 52623. Production dates for this Trimlite Pineapple was 1985 to 1988. It measures about 2.75″ tall, including the crystal and gold metal topper. Small Pineapple with a gold leaf topper – 7507060001 / 012 726. Production dates for this Silver Crystal Pineapple was 1986 to 2004. Total height of this Swarovski Pineapple is about 2.5″. Small Pineapple with a silver / rhodium leaf topper – 7507060002 / 012 727. Production dates for this Swarovski Crystal Pineapple was 1981 to 2007. Total height of this Swarovski Pineapple is about 2.5″. This small pineapple has been documented with smooth leaves or textured (hammered) leaves. Large Pineapple with a gold leaf topper – 7507105001 / 010 044. Production dates for this Swarovski Pineapple was 1981 to 2007. Total height of this Swarovski Pineapple is about 4.125″. This large pineapple has been documented with smooth leaves or textured (hammered) leaves and even with different shaped crystal components. Large Pineapple with a silver / rhodium leaf topper – 7507060002 / 010 081. Production dates for this Silver Crystal Pineapple was 1981 to 1986. Total height of this Swarovski Pineapple is about 4.125″. This large pineapple has been documented with smooth leaves or textured (hammered) leaves. Giant Pineapple with a gold leaf topper – 7507260001 / 010 116. Production dates for this Silver Crystal Pineapple was 1981 to 2008. Total height of this super-sized pineapple is about 9 3/4″ and a massive weight of over 10.5 lbs. This giant pineapple has been documented with textured (hammered) leaves only, but with and without special markings indicating whether it is a part of the ” Signed Collection” European series. Giant Pineapple with a silver / rhodium leaf topper – 7507260002 / 010 258. Production dates for this Swarovski Pineapple was 1981 to 1986. Total height of this super-sized pineapple is about 9 3/4″ and a massive weight of over 10.5 lbs. This giant pineapple has been documented with textured (hammered) leaves only, but with and without special markings indicating whether it is a part of the “Signed Collection” European series. Following up on our last post on Swarovski Savvy, I have been able to get a bit more information about the history of the Swarovski Savvy Jewelry line! 1986: Swarovski Savvy was launched in the United States. 1987: Swarovski Savvy was launched in Europe and Asia. 1995: Swarovski phased out the Savvy line in Europe and Asia. 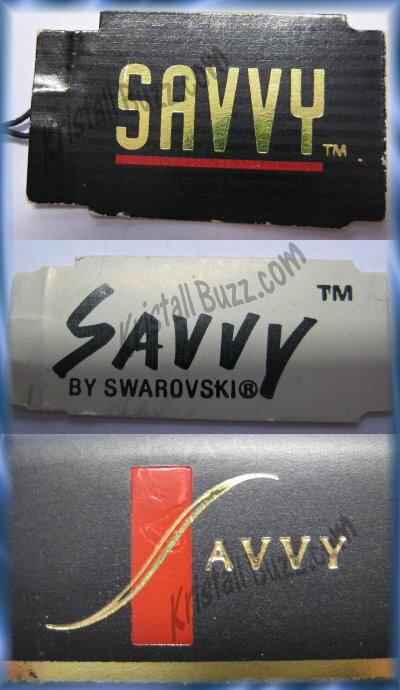 1995 – 1999: Swarovski Savvy line remained available in the United States. 1999: Swarovski Savvy was merged with the Swarovski Jewelers Collection, so the line Swarovski Savvy was ended. Ebay presently has 150+ Swarovski Savvy jewelry items in the online auctions. That includes: Swarovski Savvy Necklaces, Swarovski Savvy Pendants, Swarovski Savvy Bracelets, Swarovski Savvy Earrings, Swarovski Savvy Brooches, and Swarovski Savvy Pins. Most of the jewelry has original cards and tags, which is amazing for jewelry that is likely 20+ years old! Crystal Exchange America has put some of Swarovski Savvy jewelry on ebay . If you like auctions, check them out. Swarovski Savvy jewelry is also available in our online store at www.CrystalExchange.com . About a year ago, Crystal Exchange America took in a Swarovski crystal collection for consignment. There was a good bit of jewelry in the collection, including a few Swarovski Savvy pieces. There’s really not much known about the Swarovski Savvy product line. I decided to peruse through Amazon and Ebay to see what I might learn. Amazon did not show any Swarovski Savvy jewelry offerings. On the other hand, there were 150+ Swarovski Savvy products that appeared in the Ebay search results. I found Swarovski Savvy Necklace items, Swarovski Savvy Bracelet items, Swarovski Savvy Earrings, Swarovski Savvy Pins, Swarovski Savvy Brooches, and Swarovski Savvy Pendants. To my surprise, a lot of the Savvy Jewelry on Ebay still had original merchandise tags. From various product descriptions and a bit of other research, It appeared that the Swarovski Savvy line was sold mostly in department stores, like Dilliards (who has also sold some Trimlite-like figurines). And I did notice that many original tags indicated “Swarovski full lead crystal”. Swarovski used a number of different text fonts and styles during its limited production years in the 1990s. And it seems that Savvy was not trademarked, possibly due to its short lifespan? Crystal Exchange America has put some of Swarovski Savvy Jewelry necklaces and earrings on Ebay . If you love to bid and win, check them out on Ebay. If you prefer the buy-it-now style for purchasing, the very same Swarovski Savvy Jewelry is available in our online store. In September 2014, WBRBOnline added features to the Swarovski Database that has over 3300 items in it. The new functionality in the software allows subscribers to record and keep their inventory of their Swarovski crystal collection. Warner’s Blue Ribbon Books on Swarovski Crystal has been annually publishing books on Swarovski figurines for over 20 years! Their online counterpart, http://www.wbrb.com/, allows subscribers to access the very same Swarovski factual information as their printed books for a fraction of the price. 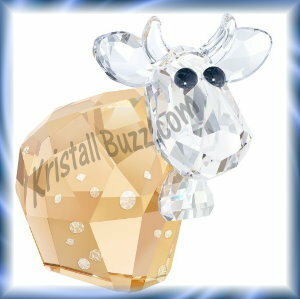 Users may view a plethora of information on current and retired Swarovski figurines: Swarovski Name, Swarovski Part Number, Swarovski System Number, Swarovski Designer, MSRP, ERV (better known as the Swarovski Value for insurance purposes), dimensions, Swarovski Introduction Date, Status (year retired or current), which Swarovski Logos are on the figurine, and a paragraph of information on the crystal piece. In the recent enhancements, Warner’s Blue Ribbon Books added new functionality to the site that should be pleasing to Swarovski collectors looking for an all-inclusive solution to inventory their Swarovski figurines. This has been welcomed by many former Star Track Software users, who found their Swarovski software was no longer being updated or supported as of 2009. Just like Star Track Software, users can add custom figurines and over-ride the ERV for their insurance values. The WBRB Swarovski Software also allows users to download a text file that can be used with programs like MS Excel to format data to their liking for a printed report. A complete Swarovski Software Demo can be found on the WBRB web site. This is wonderful news for Swarovski crystal fanatics who might be missing Star Track Software. This may just be the time to get a Swarovski Software subscription and get your inventory updated!